When I think of my favorite bike ride I always remember watching the sunrise from an altitude of over 10,000 feet and then riding down through the clouds with the awesome beauty of Maui below us and the Pacific Ocean on the horizon. The colors were so vivid it almost hurt my eyes to look at them. 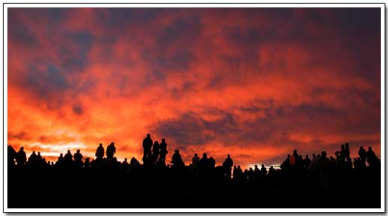 The sunrise can only be described as spectacular. I can’t think of any other superlative to describe it. The air is crisp and cool even in Hawaii, at that altitude, and depending on the cloud cover, you can see forever. Looking down into the crater is almost an other-worldly experience which, to me, looked like I imagine the surface of the moon to look. And it is gigantic. The entire Manhattan Island could fit into the crater. Oh, by the way, the volcano is inactive and has been for years. 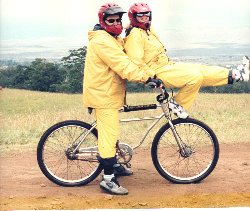 Most of the bicycle tour companies are still in operation but now they take you by van to the summit, so you can see the sunrise and look into the crater, and then take you back to the staging area at the park office, at about 6700 FT elevation, were you get geared up to descend from there. As you can see, we may be clowning around here, but they are serious about using protective gear. Most of the tour companies provide helmets and rain gear since you can get wet and uncomfortable if you ride through rain clouds. Also, most companies forbid any cameras or binoculars on the bikes since people tend to get distracted and try to use them while they are riding. Even fanny packs or backpacks are forbidden for the same reason. The tour leaders will stop at strategic points so you can get your cameras and stuff from the van and use them as you go. The bicycles that they use are heavy duty and weigh probably 40 lbs or more with 8 inch disk brakes. The roadway is smooth with dozens of switchbacks as you descend. Most of the tour companies have a tour leader that paces the riders which is probably a very good idea and is for their own safety. The top 30% is now closed since there were some serious accidents where people were riding too fast and lost control. I never felt restricted and the speed was slow enough for good control and fast enough to still get an adrenalin rush. There are also several self guided tours for more experienced riders but, be aware, the guides are experienced on the descent and set a pace that will keep you out of trouble. The self guided tours also depart from the 6700 foot staging area at the park office. Before you leave the staging area make sure your bike is in good repair and fitted to you as much as possible. And, it is VERY IMPORTANT to ride around the staging area and check the brakes. This ride is all about good brakes. The tour leader, at the front of the group, is in constant contact with the van, at the rear, and if the van driver sees anyone that is riding erratically, or appears to not be in control, he will tell the leader to hold up and that rider will be finishing the ride in the van for his/her own safety as well as the rest of the riders. They do stop at a funky little restaurant on the way down so you can get a snack and use the bathroom and the timing is good believe me. I knew we had a long way to go and never wanted the ride to end but the bathroom was a welcome sight especially for the women. When you get back down to sea level you will find your self near the little town of Paia which is a real treat for boomers especially. I felt like I was taken in a time machine back to the 60’s or 70’s with the flower children in tie dye dresses and the VW Minibuses with the hand painted pictures on them. They even had a record store (yeah I said record) with 33 1/3 and even some 78's and 45’s. This is a ride I will never forget and sadly could only repeat in part. 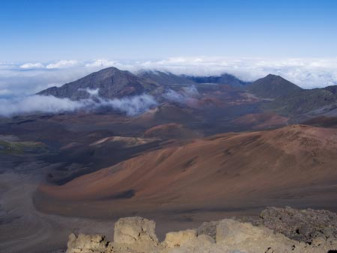 The Haleakala State Park which encompasses the upper 30% of the volcano is no longer open to bicyclers. Having said that, the remaining 6700 feet is still open to bikers and is well worth the trip. You will definitely need reservations whichever tour guide you use and they recommend a month in advance in the summer or on holidays. Here are some links to check out. I'm kinda partial to Maui Downhill. Click here to go from my favorite bike ride to home page.